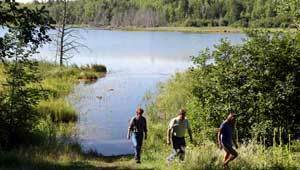 Scenic Lester Lake in Minnesota's North Woods was under substantial second home development pressure when The Trust for Public Land stepped in to help preserve the lake and its idyllic surroundings. TPL worked with the state and local partners, such as the Kabekona Lake Association, to secure funding that ensures the permanent protection of the land. The 440-acre parcel includes all of the shoreline of this 75-acre undeveloped lake, and its acquisition creates a new Scientific Natural and Area (SNA) and Aquatic Management Area (AMA) open to public hunting and fishing. Largely surrounded by state land, the new SNA and AMA connects and protects thousands of acres of high quality forest, wetland, creek, and lakeshore for fish and wildlife, as well as providing water quality and natural resource recreation benefits. Listed for sale, this land was threatened with development of hillside home sites overlooking the lake until TPL working with the State and local partners, such as the Kabekona Lake Association, quickly conserved it. Funding for this acquisition was provided by the Environment and Natural Resources Trust Fund as recommended by the Legislative-Citizen Commission on Minnesota Resources, and the Outdoor Heritage Fund as recommended by the Lessard-Sams Outdoor Heritage Council.